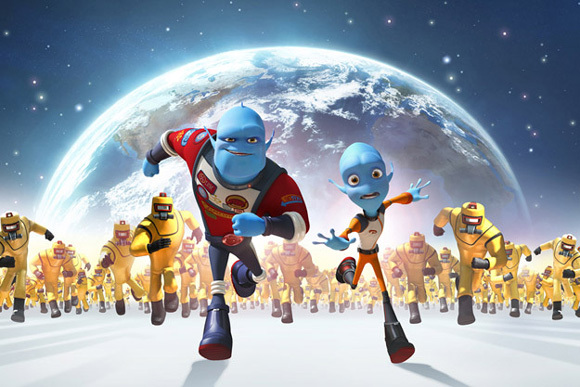 Though it seems like alien-based animated films like Planet 51 and Mars Needs Moms don't seem to strike the same quality chord as other animated films, The Weinstein Company and Rainmaker Entertainment are throwing their hat in the same ring as Escape from Planet Earth. Today it was revealed that Brendan Fraser, Sarah Jessica Parker, Jessica Alba, Rob Corddry, James Gandolfini & Craig Robinson comprise the voice cast of the 3D animated comedy which is already in production. In addition, we have the first photo of our hero aliens on the run with a whole slew of humans hot on their tail. See the photo below! The film takes place on planet Baab where admired astronaut Scorch Supernova (Fraser) is a national hero to the blue alien population. A master of daring rescues, Scorch pulls off astonishing feats with the quiet aid of his nerdy, by-the-rules brother, Gary (Corddry), head of mission control at BASA. When BASA’s no-nonsense chief Lena (Alba) informs the brothers of an SOS from a notoriously dangerous planet, Scorch rejects Gary’s warnings and bounds off for yet another exciting mission. But when Scorch finds himself caught in a fiendish trap set by the evil Shanker (Gandolfini), it’s up to scrawny, risk-adverse Gary to do the real rescuing. As the interplanetary stakes rise to new heights, Gary is left to save his brother, his planet, his beloved wife Kira (Parker) and their adventure hungry son Kip! Cal Brunker, best known for his work on Despicable Me and Horton Hears a Who! is directing Escape from Planet Earth from a script he also wrote with Bob Barlen based on an original screenplay by Tony Leech and Cory Edwards. Brunker sounds pretty excited about the film saying, "Escape from Planet Earth has got it all: explosions, romance and a cast of hilarious aliens. What more could you ask for?" Hopefully a quality story and more than just some good-looking 3D animation will be in there somewhere. It's going to take a lot to measure up to Pixar's work or even the more recent animated films from DreamWorks Animation, so I hope they're up to the challenge. Woops, just corrected that. Jessica Alba is definitely in the cast, just accidentally left her out originally, but she's listed now.